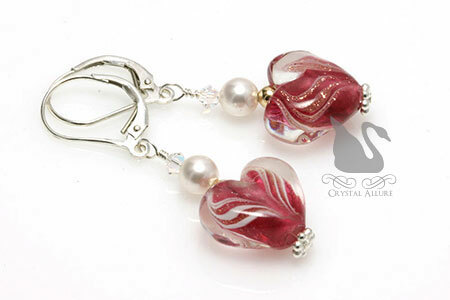 Such pretty earrings...don't you just love lampwork anything!!! That's a great name for the piece! Pretty too! Heather: Yes, I do love lampwork. The look is just so unique and beautiful. I've actually taken a hot glass class and lampworking is not easy. I suppose once you grasp it, it's fine. I have a few of my own beginner lampwork beads that I have yet to get into designs. But one might be coming soon. Alex: Thanks for the secret crush connection. I just KNEW someone else out there has gone through one. Thanks for stopping by Dawn and for your lovely comments.